The St. Edward Central Catholic High School football team, in Elgin, Ill., was forced to relinquish its home-field advantage Sept. 18 after a chemical mix-up destroyed its field, the Chicago Tribune reports. 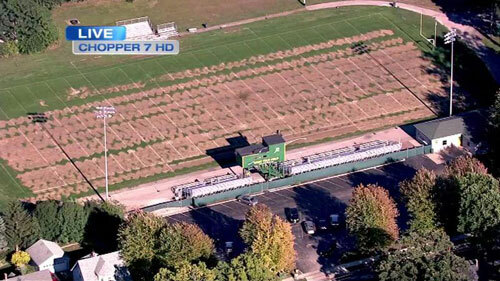 The lawn care company responsible for maintaining Greg True Field, St. Edward’s home field, accidently applied weed killer instead of fertilizer. The mishap killed two-thirds of the field’s grass. The company at fault wasn’t named in the Tribune’s report. Instead of a home game, the St. Edward football team will travel to Plunkett Athletic Complex, which has artificial turf, to face IC Catholic of Elmhurst, Ill., at its home stadium. One game was played at Greg True Field since the Sept. 4 incident, and the St. Edward’s Athletic Department will re-evaluate the field before deciding where the three remaining home games will be played. Needless to say, White told the Tribune St. Edward would look into resurfacing the playing field after this season. A similar misapplication incident killed 75 percent of the grass at the University of Findlay May 2014.